Join the discussion on our forums! Come discuss Frozen Crusher over in our dedicated Frozen Crusher discussion topic. TIL a neat interaction; Frozen Crusher with Windfury. 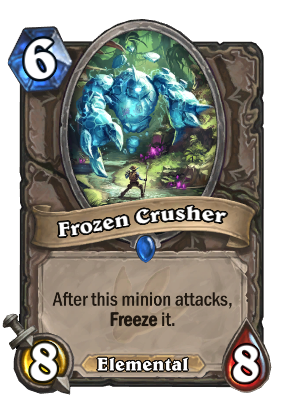 Rather than being the most useless keyword you could ever give to this minion (How can Frozen Crusher attack twice a turn if it gets frozen after the first hit? ), it instead perfectly cancels out the existing card text. After looking into how Freeze works on friendly minions with the introduction of Cryostasis, I learned that were you to freeze a minion, it would unfreeze either at the end of the same turn or your next turn, depending on whether it could attack before you froze it. If you play a minion, and on the next turn you attack with it and then freeze it, if doesn't unfreeze. However, if you freeze it without attacking, it immediately thaws out. However, if the minion also has Windfury, you are allowed to attack once and it would still unfreeze on the same turn. Can someone tell me the science of freezing ice? I am the sad man. He was very critic of a certain Disney movie. "Freeze it." Great... freeze what?! Frozen Crusher or the enemy that is being attacked? I would read this as freeze Frozen Crusher after it attacks. Would it be broken if they gave it charge can't hit face the turn it is summoned? Its good in the sense it can draw out removal without forcing out lifepoints, curves into blaze caller and using a silence. it plays essentially as a 4/8 for 6, and is weak to shatter. Cool card imo and great for f2p players. It's a shame this card won't see play because that art is amazing. So this is why Ice Lance is rotating out. It freezes itself allowing ice lance to do dmg to it, that's obviousely too overpowered. This isn't as trash as it looks. The freeze can easily be silenced and you can always taunt it up. With 2xFire Plume Harbinger, Shamans can summon this on turn 4 but it might find more success on other classes even if it is niche success. Why play this when you can have Bittertide Hydra? I think this was made specifically to be a poor man's Bittertide, kind of like Reckless Rocketeer for Leeroy. That's actually pretty nice of BLIZZARD, HAHAHA.